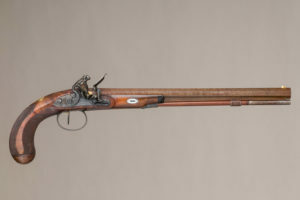 Flintlock pistol, made by Wogdon & Barton. The Metropolitan Museum of Art is opening a new exhibit featuring exquisitely crafted firearms, highlighting the abilities of British gunmakers. The exhibit, entitled ‘The Art of London Firearms’, features seventeen separate firearms, each made in London. Instead of rifles and long guns, the focus will be on pistols dating from the mid-eighteenth century into the early nineteenth century. Included is a pistol made for the Prince of Wales, King George IV of England. The pieces are pulled from the Metropolitan’s permanent collection and many of them have never been on display. In the period encapsulated by the show, a group of gunmakers with workshops on the outskirts of London and became fierce competitors. This competition led to rapid design growth, paring down Baroque design elements for simple, elegant, and efficient design. These gunsmiths include Durs Egg, John Manton, and Samuel Brunn. When: The exhibition opens January 29, 2019 and lasts until January 29, 2020. For more information visit the exhibition website. Where: It will be in Gallery 380 of the Metropolitan Museum of Art, located at 1000 5th Avenue in New York City and is open Sunday through Thursday from 10AM to 5:30PM, Friday and Saturday from 10AM to 9PM. 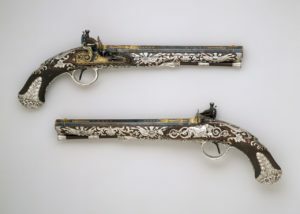 Pair of flintlock pistols, made by Samuel Brunn. Admission is $25 for adults, $17 for seniors, $12 for students, and free for children under 12. New York State residents have the ability to choose what to pay. This exhibit and all others are included in museum admission. There are also multiple membership options available. Well-made firearms have always had collectible value and can be sold for a tidy sum. When not in museum exhibits, guns like these are often in personal collections. Collectors can find more information on the sale of these and other types of firearms here.